Chelsea Thai, a longtime favorite in that neighborhood, opened in its new home at 192 First Ave. between 11th Street and 12th Street back on Friday. You can find the menu (PDF!) here. 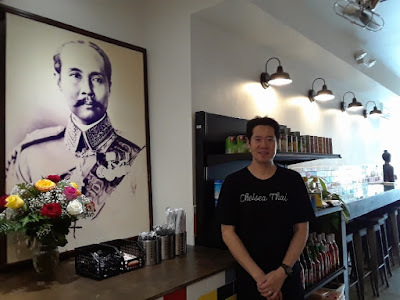 Meet the owner of Chelsea Thai at Chelsea Market. Saruj Nimkarn is the founder,owner and head chef of Chelsea Thai. He grew up in Bangkok Thailand and came to the US when he was a teenager. He then decided that he wanted to bring a taste of his home to the states and opened up this restaurant so he could share his favorite comfort foods with all of us. One of the first restaurants in Chelsea Market, Chelsea Thai will be celebrating its 20th anniversary this year. This is great news for our neighborhood, especially since East Village Thai closed last month. I was a loyal patron of Chelsea Thai for a number of years in the Chelsea Market until they closed. Its a great little shop where not only can you purchase yummy Thai food, you can also buy a variety of food goods such as curry pasta, fish sauce, noodles, and so forth. Can't wait see the new place. Welcome to the hood! It's closed. Anyone knows why?